Do You Have a Yoga Buddy? Recently, I had a yoga date. Zhanna (a dear friend and fellow teacher from Yoga Centre Toronto) and I got together to practice. We do this every so often and every time we do, I’m always reminded about just how much I enjoy these practices. 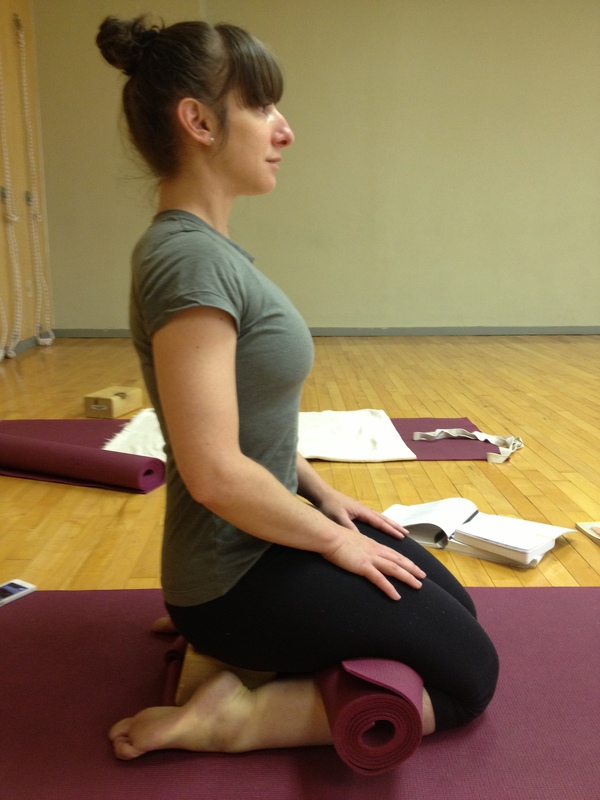 We began by exploring Virasana. Interestingly, we observed that our bodies had opposite tendencies. For Zhanna, the weight needed to be transferred to the big toe side of her foot. For me, to the small toe side. For Zhanna, the shoulders tended to be too far forward. For me, too far back. Observing how differently the weight on our feet was distributed in Virasana led us to explore our feet and legs in Tadasana. 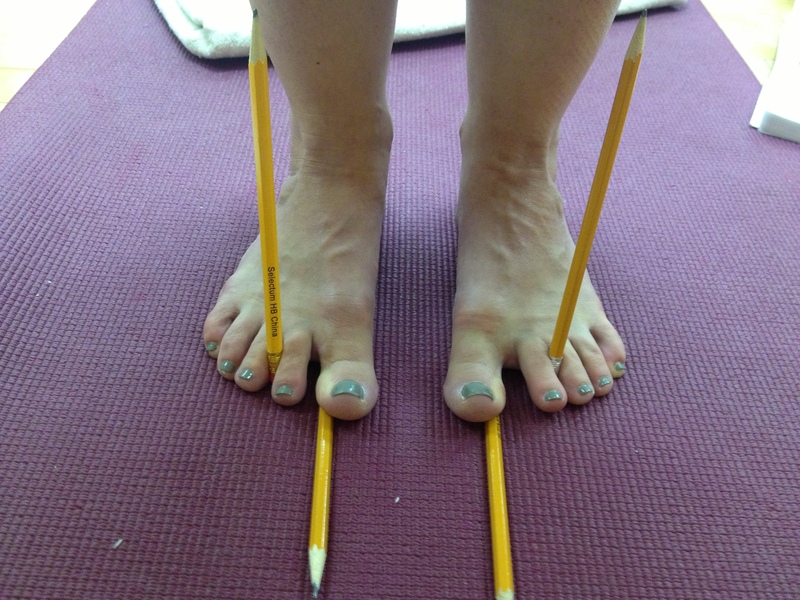 Zhanna’s feet have a tendency to be flat and she works consciously to build and strengthen her arches. Also, her big toes tend to round. For me, my issues have a lot to do with the shortening of my inner heal and that the nail of my big toe slants inward. Then, we worked with pencils :). 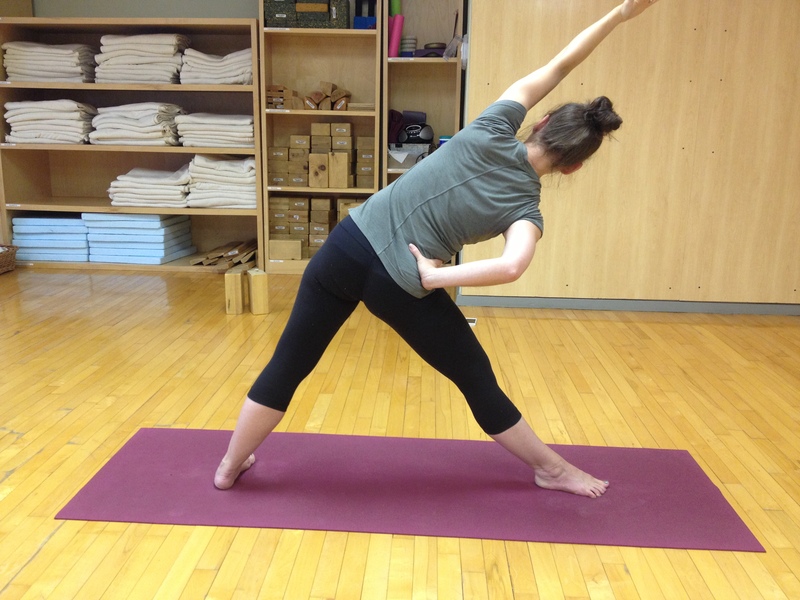 After the pencils, we started looking at some poses from the IJ1 syllabus. At one point we were playing around with Lolasana and trying various presentations of the pose. We were interested in trouble-shooting the pose and figuring out different ways we could help students who might struggle with it. I was trying a presentation where I lift up by pressing my hands into the seat of two chairs. Zhanna was behind me and she said, ‘I must take a picture to show you what your back looks like’! I have a slight scoliosis which shows up in my standing poses and is particularly noticeable in my forward bends, but I had never seen it manifest quite this intensely! This took our practice in yet another direction and thanks to Zhanna’s keen eye, I got some great feedback on areas of my back that are really elusive to me. We worked through several presentations of Utthita Trikonasana all with the aim of bringing some awareness to the concave side of my back. Having a yoga buddy, in my opinion, is a real luxury. If you relied solely on your yoga buddy to get you to your mat, I doubt you would make a ton of progress with your practice. That said, sometimes, having a yoga friend to motivate you can be just what you need. I feel fortunate because I have a few yoga buddies with whom I enjoy practicing. It’s not easy to coordinate our busy schedules so it doesn’t happen often, but when it does, it’s always fruitful. The yoga journey, while satisfying, can also be lonely. Explaining the what, why, and how of yoga to people who don’t practice can be…challenging. Connecting with people who understand why you tie yourself up with straps, place blocks in odd places, and invert yourself, is definitely a good thing :)! a) We each do our own practice. Occasionally, we’ll ask each other a question about an asana but for the most part, we stick to our own practice. I find having someone near by to ask a random question to can be really helpful. I also find practicing near someone else motivating and have found that it can help to keep me focused. b) We pick a few poses and/or areas of the body that we want to concentrate on. Then, we workshop our way through it. Collaboratively, we figure out our strengths and weaknesses, compare and contrast, and learn from each others experience. c) We focus on teaching. If I’m learning a new presentation of a pose or a new pose entirely, I may practice how to teach it with one of my colleagues. I’m often interested in their feedback on how it feels to have me modify them in the pose. Practicing with others can be insightful and rewarding, but it can also be distracting. I’ve definitely had experiences where the intention was to practice but somehow we ended up just chatting. Or, the presence of the other person seemed to hinder my practice and I ended up feeling self conscious. I don’t know that I can clearly articulate what makes for a good practice partner but I do know there are some people with whom I can practice and some people with whom I can’t. Ultimately, practice is a very personal thing. How do you like to practice? Do you have yoga buds? What do you think makes for a good practice partner? I miss my Yoga Buds in Toronto. Its wonderful to see your website and to read your posts Stephanie. I knew all along you were a Yogi and a writer with lots of good info to share. This subject of yoga is so vast I am sure with your insights you can keep blogging forever! Namaste, Yoga Bud. thx Deb, I miss you too!!! I hope you will come visit us soon! xo. yup! yoga buddies are fun- its the whole reason club asana is exists! for me, they challenge me to go deeper, and keep me accountable for keeping on with my practice. 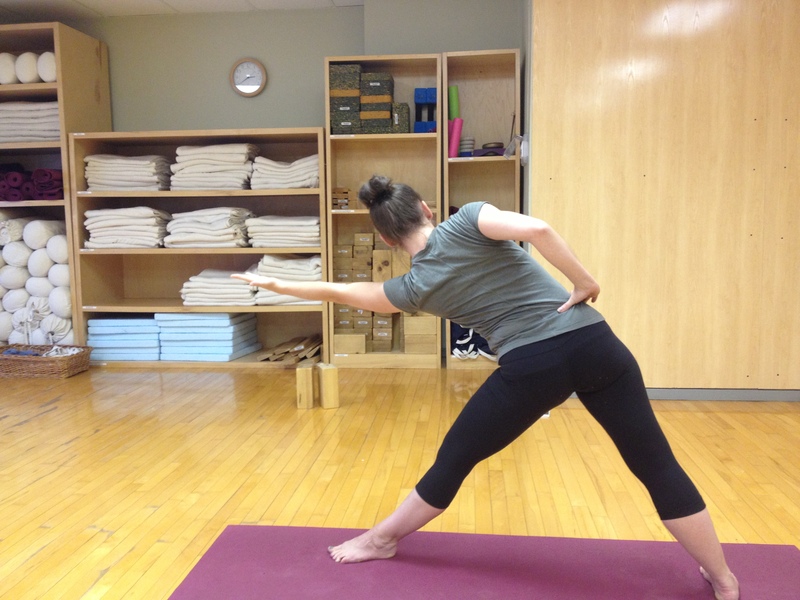 we usually decide on one asana/aspect that we want to work on, and go from here. there is also the fun game of “flip through light on yoga” and take the adventurous route to whatever asana the books opens to! Great idea! You will never go wrong looking to Light on Yoga for inspiration :). Thank-you for sharing! This is a great post, Stephanie! I used to always do my practice in the studio with Lois Steinberg, and of course she would constantly notice things and give me suggestions for what I could do to gain further awareness in a pose, but I would also help her by putting weights on her or checking her alignment. Even a senior teacher can use a yoga buddy! I love that variation of Lolasana with chairs. Most of my best yoga ideas have come from this type of “playful” practice. thx! I learnt that variation from a senior teacher out west (BC, I think). It is so true, we do need to be playful in our practice. Helps us to not take ourselves too seriously :). We are all always learning, right?